Enterprise 2.0 and the adoption and use of collaboration technology in general have provided numerous benefits to the corporate world from increased efficiency in communications to a more sustainable corporate memory. In fact, according to a recent study by Frost & Sullivan, 36% of a company’s performance is directly linked to the quality of collaboration within. Deploying a stand-alone social platform is, metaphorically, replacing the water cooler with a cooler alternative. In other words, companies should focus on finding ways to ensure that Enterprise 2.0 will centralize communications regarding all processes running through other corporate systems regardless of whether the system is Customer Relationship Manager (CRM), Enterprise Resource Management (ERP), or Business Intelligence (BI). Social or collaborative BI is the use of Enterprise 2.0 tools and practices with business intelligence outputs for the purpose of making collective decisions. BI is a natural application area for Enterprise 2.0 because of its potential to integrate fully and successfully to provide knowledge and content management. The demand for social features in BI solutions already exists with 59% of companies considering “the ability for users to share and collaborate” as one of the most important features when purchasing a BI solution, according to Information Week. User Adoption Challenge: The popularity of social platforms has the potential to boost staggering adoption rates in BI; approximately only 10% of business users are actively using dashboards and reports. Dispersed User Challenge: Enterprise 2.0 platforms provide the means by which users from different departments and geographies are brought together, which is critical for interpretation and use of BI outputs, as well as for producing corrective actions in consensus. Big Data Challenge: Increasing volume, variety, and velocity of data each day requires many “hands on deck” to derive actionable meaning from BI reports and analysis, conveniently available through social platforms. Traceability Challenge: BI findings are regularly applied in various business decisions and actions, which, in return, results in changes in trends and outcomes. In order to make sense of such changes, it is imperative to have a collective corporate memory of historical decisions and actions, such as what Enterprise 2.0 provides. Rich and Fresh Contents: Most BI outputs are set up in logical manner, e.g., scorecards, dashboards, and reports populated with new data daily, weekly, or monthly. This provides a continuous stream of new content, which, as consumer social media practices have proven, is a vital element for sustainability of social initiatives. Diverse and in-Depth Comments: BI outputs also provide “hot” discussion topics, topics that are among the most discussed and commented on within an enterprise. BI provides these opportunities for every user to express new ideas that may have a direct impact on the company’s bottom line. Knowledgeable and business-savvy BI vendors began incorporating basic collaboration capabilities, such as annotations and report sharing, into their tools. Unfortunately, users are not yet taking advantage of these capabilities, as, according to The Data Warehousing Institute (TDWI), of those using BI solutions with collaborative features, only 16% are using these particular features. The most important reason behind the disconnect between demand and acceptance has been the “one-size-fits-all” approach in most social BI implementations, i.e., not selecting the right approach for a company’s individual social and BI maturity levels. 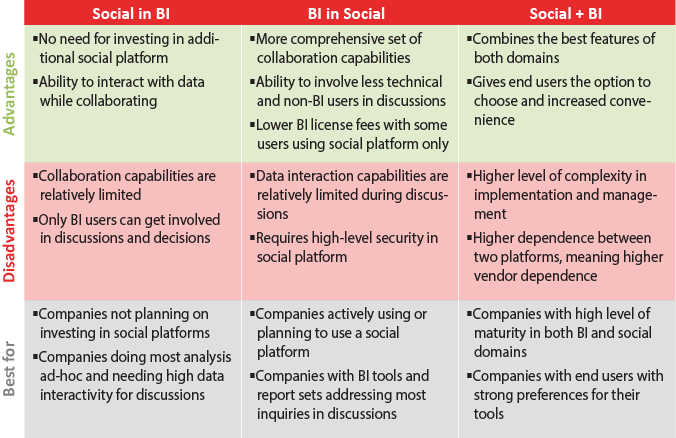 Social in BI approach is the most common and stand-alone approach. This approach incorporates basic collaboration capabilities directly into the BI solution, with no integration with independent social platforms. These capabilities typically range from annotations to storing and sharing reports between users. This approach primarily assumes that all of the BI interaction will take place inside the tool where users have the ability to interact with the data while having discussions. Although this is the most common approach, it is also the one most commonly criticized, e.g., Gartner states, “These BI collaboration capabilities are tied to the BI artifact as opposed to a decision artifact and are missing an environment for supporting decision making” (2009). The second approach, which is relatively less common in current BI solutions, is BI in social. In this approach, the BI platform is only used as an information factory, producing facts and reports, which are posted and discussed on a separate social platform. BI solutions following this approach do not have built-in collaboration capabilities. Instead, they integrate with social platforms available in the market, such as Yammer, Jive, Dropbox, etc. As a result, although this approach foregoes the ability to centralize all BI activities, it does have the ability to centralize all the social activities, i.e., this approach brings the data to where the people are instead of bringing the people to where the data are. This final approach combines the capabilities and methods used in the previous two approaches: built-in collaboration capabilities as well as the ability to integrate with existing social platforms. BI solutions using this approach provide to users the flexibility to use the platforms with which they are most comfortable. Combining “Social” and “BI” also provides the highest level of integration between social and BI domains, wherein annotations on BI reports are synchronized with comments on social groups, and social platform users can interact with the posted reports for ad-hoc queries in real-time. Choosing the right approach from the three alternatives depends on various factors, such as social and BI maturities, existing platform investments, data and collaboration culture, and no one approach can be considered as a global best. As a result, companies should evaluate the advantages and disadvantages of each approach, along with the ideal circumstances for each, and then choose the right approach for their individual needs. 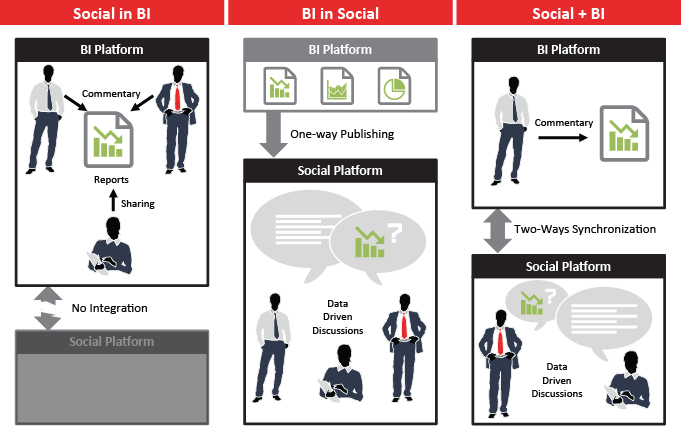 Social BI initiatives start with the incorporation of BI into the overall Enterprise 2.0 strategy of an organization. Social BI is not a stand-alone initiative, and it cannot be treated as such. Selecting the right approach depends on the overall strategy; for example, Social in BI would not be the right approach for a company focused on a full-fledged social strategy. Another critical consideration to take into account at the beginning of social BI initiatives is the scope and vision. More often than not, companies consider posting monthly static reports via a portal and then expect users to annotate them. This approach can only be effective in a very short-term period. In an ideal social BI initiative, repetition in content should be limited in order to provide end users with new ideas to avoid apathy by end users who believe they have already seen the content. Hence, social BI requires a completely different mindset from regular enterprise reporting initiatives. As for the contents, every report posted should ideally have an action point, i.e., a decision to make, an opportunity to take, or a risk to evaluate. Having an action point requires initiating the content design from decisions and trends rather than from a list of reports and users. This action point should be followed by a suggestion or designation of the person responsible for taking the action needed. Once the content is set, the next critical step is defining processes around how the social discussions should evolve into effective and actionable business decisions. While users should have the freedom to contribute, there should be governing rules to ensure the most productive use of the findings. The final step is encouraging participation among users. After all, a social platform without social activity is useless. Incentives, recognition, and even gamification can encourage consistent social activity. It is imperative that top management participates in these discussions so that employees may see that their comments are considered valuable contributions. As in all initiatives, it is best to start small, test, and learn before launching a complete social BI initiative, as every organization is different, and finding the best approach may require some tweaking. CIWare (Causal Intelligence Ware) is a proactive, social business intelligence solution developed by Forte Wares. Designed with the ability to suit various business problems, CIWare enables businesses to make faster and more precise decisions. Unlike traditional BI solutions, CIWare focuses on change in business; rather than looking at a snapshot of business indicators, CIWare analyzes change over time as well as the contribution of various factors to this change and delivers the results to end users across various social platforms. For more information please visit ciwa.re or email us at info@fortewares.com.